Zambia’s Father Paul Samasumo has been elected as one of the two SIGNIS World Vice Presidents for the period 2017 – 2021. The Italy-based Fr. 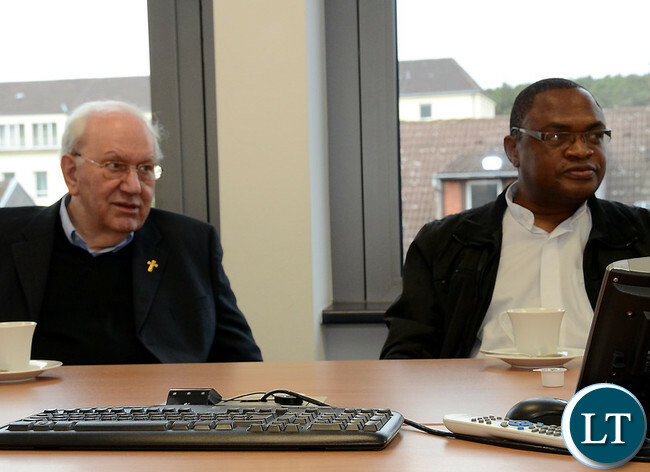 Samasumo who is head of Vatican Radio’s English Africa and Ki-Swahili Services becomes the first African to hold one of the top three positions in the worldwide association for Catholic media professionals known as SIGNIS. The election of Fr. Samasumo took place on the occasion of the SIGNIS World Congress 2017 which has just ended. The meeting was hd at Laval University in Canada’s Québec City from 19 June to 22 June. American National Ms Helen Osman was elected SIGNIS World President taking over from Mr Gustavo Andujar who did not seek re-election. The two 2017 – 2021 Vice Presidents are Fr. Samasumo of Zambia and Mr LJ Sinniah of Malaysia. The three together with the Treasurer constitute SIGNIS world’s executive committee. Commenting on his election, Fr. Samasumo said he sees his election at the top helm of the Catholic Association as an honour to all Africa. “I am humbled and grateful to the assembly for their confidence in me and my continent, Africa. I thank my superiors at the Pontifical Secretariat for Communication who have always given me the space to work with SIGNIS. My candidature was actually not proposed by Africa, but once it was made, my African brothers and sisters at this Congress warmly embraced the idea,” said Fr. Samasumo. Meanwhile, on the sidelines of the SIGNIS World Congress, The African Assembly of delegates elected Nigerian priest and university professor, Fr. Dr Walter Ihejirika as new SIGNIS Africa President. The administrative headquarters of SIGNIS, the General Secretariat, is in Brussels. There is also an office at the Vatican, SIGNIS Services Rome, which provides technical and material support to church and secular organisations all over the world. The statement was issued in Quebec, Canada by Fr. Walter Ihejirika who is the SIGNIS Africa President. Next articlePresident Lungu expected on the Copperbelt tomorrow for a 2-day working visit. You are better-off there than in zambia fighting your fellow Bishops over whether zambia is a Dictatorship or not. All these job where offered to Frank Bwalya when he was at Radio Chengelo. Who is samasumo in the picture above. The one on the left is a pale skinned man. I hope that PF now understands that messing up with Catholics in Zambia will get a worldwide audience. Catholics are not alone and isolated under PF. The whole world is watching the Dictator from Chawama. The Zambian Catholics have the keys to the Vatican Radio! Congrats to Fr. Samasumo for his ascendance to a high post in the Catholic Media Group. We are proud of his journalistic talents. Congratulations to Father Paul Samasumo. Your election to this higher is a recognition of your achievements thus far and the confidence that people have in you. God bless you. Any comments from frank Bwalya? Pull Down syndrome! One wonders what some people do. Give praise where it is due! Whether personal achievement or not, the guy is Zambian and am happy for him! Learn to be positive for once. People will always where someone comes from because of the achievements the make in society. People talk about Kaunda or Kalusha the moment they realize you are Zambian in foreign nation….you may not like them but they are recognized elsewhere. Proud and self centered people will never see positives in others! and most of these, if not all, posting negatives and insults are upnd cadres who only yesterday were praising his Lordship mpundu. these guys really know how to decampaign themselves. go on and insult our leadership as much as you wish, but just know that we are voters who are even better campaigners than you. @12, Mr. Mature, I don’t think Nez is a true representative of the majority of the UPND cadres just like I don’t think you’re a true representative of all of us voters and campaigners. Congratulations Fr.Samasumo, may the good Lord continue protecting you. If only Africans knew the history of this church!! Hearty Congratulations to Fr. Paul Samasumo on this great achievement. I always remember Paul from our time together in school as an intelligent, witty, soft-spoken and humble guy. Even his walk is that of someone who treads carefully as if to spare the nyelele from being stepped on. You deserve it Paul! congratulations to him. I think Zambian Catholics are respected world wide. at some point Milingo was also given a big position but whatever happened to him. The devil has truly arrived in Zambia…..